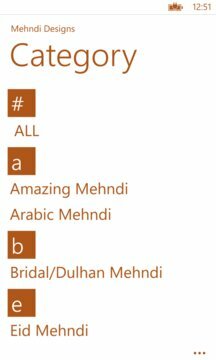 We present you hundreds of amazing Mehndi designs - as per Wedding, Party, Eid, Festivals or any special occasions including Indian, Arabic, African & Pakistani styles. Your suggestions are much valuable for us so don't forget to provide feedback after using the application. In case of any problem please feel free to contact us. Your feedback will be appreciated.... Thanks !!! 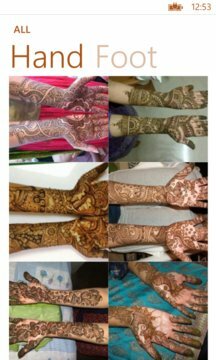 • Latest Mehndi Designs Collections. • Well-designed interface with high resolution images. • You can Share the Images on Social network like Facebook, Twitter, Instagram etc. • You can Download the images in your phone or SD Card. • You can Zoom in and out the images. • Simple designs to cluttered designs, all in one app. • Hundreds of Hand Front and back side designs. • High Quality Images (HD). • On Display Image, Next/Previous Image Switch via Scroll. • Hand and foot designs collection separately.